There is a question about: Does the Bowflex TreadClimber Live Up to the Hype? We will start with Bowflex TC10 and also TC20. How does it really work, is it actually such a unique mechanism, and most of all, is it worth your hard-earned dollars? Let us take a look on a few review about them two. 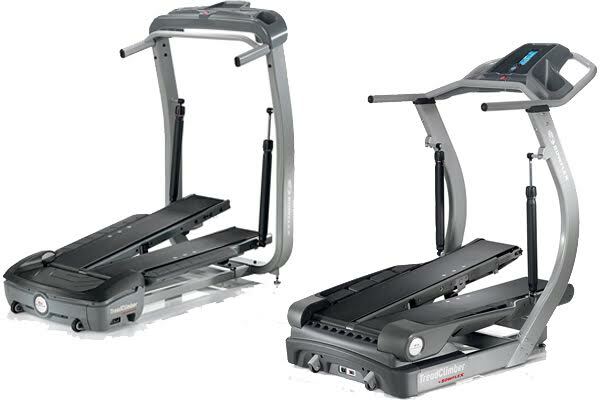 The Bowflex TC10 is one device with 3 different functions as a treadmill, a stairclimber, and an elliptical trainer. There are two long pedals, called treadles for starting out flat but can be inclined up to 40% to support some efficient exercises. It is an efficient tools because when you do training on a steep incline, it is at full tilt and your fat will be burned quickly. The TC10 has its own goal setting which is setting weekly goals for 90 minutes of training and tracks progress for one user. You’ll also get a Climb Indicator. It has an ergonomic console to hold water bottles and reading material, space efficient with 50.6 inch L x 30.3 W footprint to make an easily move the machine if needed. Last, it has high capacity with a weight limit of 300 pounds. It weighs about 185 pounds and has a steel frame. The TC20 is an advanced incline trainer 3 in 1 functions which means can become a treadmill, a stairclimber, and an elliptical trainer in just purchasing one treadmill. The abilities are about uprgrading include a heart rate monitor, a higher weight capacity, longer treadles, and extra programming to help keep you motivated. It got 40% incline doubles the rate of fat burn according to many trainers. It is also featured with Goal Oriented Coach technology to set personalized training goals and tracks progress for two users. The heart rate monitor is as an integrated pulse monitor helps you train within your ideal heart rate zone. So far, the features are mostly similar with the TC10. If you want a fast or quick results from your workout activities by using a treadmill, you should better choose Bowflex TC20, because The TC20 delivers challenging workout sessions and fast results and this machine is designed for people who don’t need distractions to enjoy exercise. But, for those who are a serious exerciser, The TC10 is a very god treadmill for you. We mention it as a serious exerciser, because in TC10, you will get a much better workout from a TreadClimber than with a compact treadmill.